Each unit is described by numeric traits. These are Attack, Defence, Armor and Speed (measured by the time of travel across 1sector of a map). Most units also have Bonuses allowing them to additionally destroy some units of a specific type. The above traits are increased with each level of certain technologies reserached. unit bonuses come into play after the first battle round and remain active until the end of battle, altering the outcome of each consecutive battle round, until the unit which possessed them is destroyed. The clues you gain are not certain, however. If the enemy has good counter-intelligence, you may get little or no info at all. To read more, visit the Spying section. When one of your islands or mineral deposits is under attack, or when you attack other player, you will see a notification in the system log. Each battle takes at least one turn which lasts 5 minutes. During this time you can observe the battle progress by clicking on the notification - this will bring you to the combat screen. 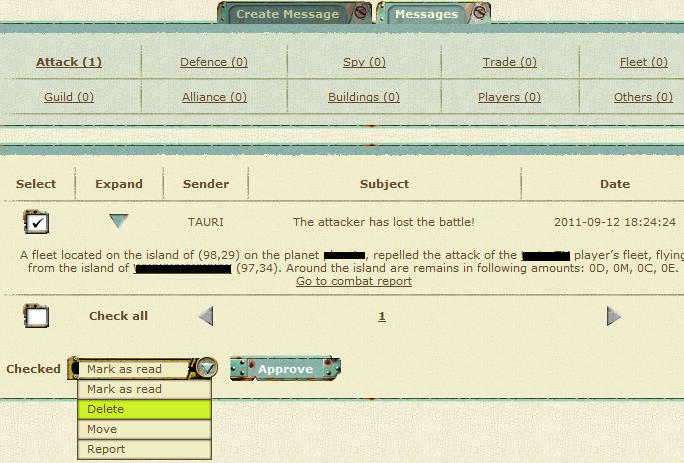 the report from battle is available in the messages after the battle ends. Large-scale conflicts Small attacks can be carried out individually, but fighting a group of people united in an alliance can pose a real challenge. Remember that the allies can help each other defending themselves. They can also organize better. In such a situation you may not complete the task single-handedly. When a war begins in game War can be waged between alliances only. After defining the victory conditions (the number of points scored on your enemy), you can fight as normal, but each unit you destroy counts towards a common goal. You have to remember that without scouting and espionage operations you will have difficulty with making the best decisions. Knowing your enemy’s fleet movements, places of stationing of his fleet and military manpower in specific locations can greatly simplify war activities, and you will always be one step ahead of your opponent.